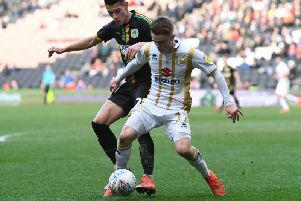 Strength in depth is helping MK Dons' strikers stay sharp, according to Rhys Healey. Dons' last 12 goals have been scored by strikers - Chuks Aneke, Kieran Agard, Robbie Simpson or Healey himself - as Dons have climbed to fourth in League 2. Healey, who admitted he should have had a hat-trick against Cheltenham last Saturday, has three goals to his name so far this season and is in line to keep his place in the side this weekend against Cambrigde United with Kieran Agard carrying a knock. And the man on loan from Cardiff City says the form of the strikers ensured everyone remains on their toes to stay in the starting 11. "The good thing is that the shirt is always up for grabs with the size of squad and number of strikers we've got," he said. "When I step over the line on a Saturday, I just want to perform and keep my place, but if I don't, we've got the players to come in and fill the gap. "I don't mind who I play alongside, each of them has different ways, all are hard working. As long as I'm out there and we're both performing, I don't mind. "I was so frustrated with the chances I missed leading up to the goal (against Cheltenham). I was lacking a bit of confidence I think, I should have had three! But as a striker, it was important to get the goal and then the win. The longer you're in this environment, it gets easier. "I missed two one-on-ones but I knew if I kept working, another chance would come, but I knew when it came I couldn't afford to miss it."